Any product added to motor oil in a vehicle engine is considered an oil additive. This product segment includes compression builders, engine stop-leak products, engine treatments, motor-flush products, oil stabilizers, oil treatments and smoke treatments. However, don’t confuse these products with the additive packages blended with base oils that comprise the motor oil itself. Benefits of oil additives can include gaining longer useable life out of the vehicle, saving on mechanical repairs and even protecting the environment from liquid and air pollution, according to Clay Parks, vice president of development for Holly, Michigan-based Bar’s Leaks. Oil additives also can prevent more serious issues from occurring in a vehicle. Other additives that protect the metal can help to prevent wear when starting the engine, especially during cold weather. These additives work to protect internal moving parts until the oil gets flowing, in addition to preventing damage from a low-oil situation. Oil additives can be especially useful for vehicles driven in hot climates or other conditions that cause the engine to work harder, such as racing, heavy-duty trucking, towing and stop-and-go driving. The function of an oil additive depends on the type of product. Compression builder – This is an additive or combination of additives in a product that aids in increasing compression in a worn, high-mileage engine. Compression builders can free up stuck compression rings and fill in cylinder-wall scratches. Engine stop-leak product – Most engine stop-leak products contain a seal conditioner that takes an older, hardened, shrunken leaking seal or gasket and makes it soft and pliable, performing a minor swell so it can do its original intended function of keeping the oil inside the engine. Some also might thicken the oil, which can help stop leaks. Engine treatment – This is a product poured into the engine oil that does something to the metal internal parts of the engine. The function could be to clean or coat the surfaces to reduce friction. Most can be used in newer and older vehicles. Other products in this segment include oil supplements designed for a specific function such as engine break-in. Motor-flush products – Motor-flush products usually are used in North America when the vehicle is experiencing a loss of oil pressure or some other issue related to improper maintenance. Some contain detergent packages and others contain cleaning solvents. In other parts of the world, it’s a normal part of the oil change to use a flush before installing new oil. Oil stabilizer – An oil stabilizer includes some form of oil additive that might perform multiple functions, and it can combine several product segments to improve the ability of regular motor oil to lubricate and protect engine parts. Oil stabilizers provide the largest benefit to customers in the racing and heavy-duty markets. Oil treatment – Traditionally, products that are considered oil treatments modify the oil in some way. Most are viscosity modifiers, which make the oil thicker. Smoke treatment – A smoke treatment is an additive that helps reduce oil burning, which usually results in blue exhaust smoke emitting from the tailpipe. These types of additives usually work by using long-chain polymers and viscosity-index improvers, and some by cleaning the oil rings. Leaks – First, confirm that the engine oil is what’s leaking. Usually, engine oil is a dark-brown fluid. Next, purchase a good-quality stop-leak/sealer product. Smoking – Blue smoke from the exhaust tailpipe is caused by oil being burned. Look for a smoke-treatment product. Noise – This can range from a light ticking to a hard knocking. Depending on the range of noise, multiple products might be able to help, including engine and oil treatments or a stabilizer product. Power loss – If it’s caused by normal wear of an older engine, compression builders can be the solution. Wear – Using engine-treatment products to prevent further wear from occurring – or if severe enough, an oil-treatment or oil-stabilizer product – can help get more miles out of the vehicle before repairing or replacing. Low oil pressure – First, check to make sure the oil is at the proper level. If it’s low, it might be a leak or burning issue. If it isn’t low, then the problem most likely is caused by internal wear that will require an oil-treatment or stabilizer product. 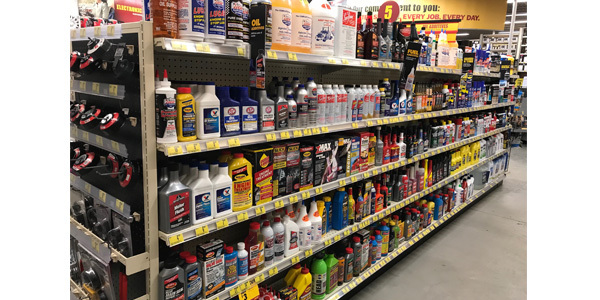 Most of the reputable manufacturers of oil additives have been around for a long time, and their products are available just about anywhere quality auto parts are sold. For customers who make their buying decisions purely based on price, you might want to remind them that with oil additives, you get what you pay for. “If the price seems too low, the performance is probably low also,” Parks says. Many DIYers are conducting research online before coming in to a parts store. Any company that stands behind its products will make it easy to get more information, via a phone call, email or social media. Lastly, Parks says, if a product’s claims seem too good to be true, they probably are.